To be honest, this isn't really a recipe so much as a list of ingredients and some general guidelines -- homemade Caesar salad dressing is a wonderful thing, but it's best when you make it to suit your own preferences. Taste, and adjust as necessary! 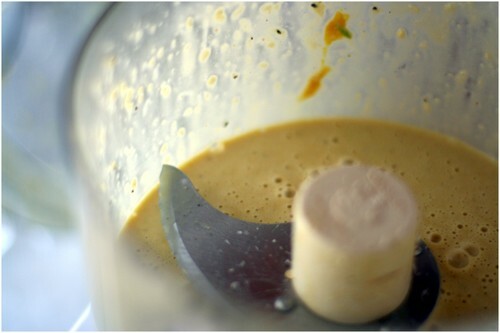 Whiz the garlic cloves around in the food processor, then toss in the anchovies and pulse a few times more. (This helps break these two ingredients down before adding the rest.) Next, add the egg yolk(s), mustard, red wine vinegar, and Worcestershire sauce, and pulse a few times to combine. With the processor on, add the olive oil in a steady stream to desired consistency and concentration (the more olive oil you add, the milder the dressing will be), stopping periodically to taste. Add more red wine vinegar if necessary, then add lemon juice, finely grated Parmesan, and black pepper to taste. Wash and dry your romaine hearts. Cut off any stems and separate the leaves. You may chop or tear the leaves into smaller pieces, but I generally prefer to serve them whole -- in this case, the salad can be eaten with your fingers. Dress the leaves liberally, and serve topped with more Parmesan and croutons, if desired. To make croutons, dry out a few slices of rustic bread in a toaster or oven until they are crispy on the outside but still slightly tender on the inside. Cut into cubes. Heat a few tablespoons of olive oil in a pan, toss in the croutons, and season with a sprinkle of your favorite dried herbs (I like rosemary and thyme), some garlic, if you like, and kosher salt and black pepper. When the croutons have turned a toasty brown, remove from the pan and serve over your salad, if you can refrain from eating them then and there.